Thinking about launching a car dealership in Connecticut? In order to conduct your operations legally in the state, you will need to obtain a CT dealer license. The licensing process, as in other states, is rigorous and aims to ensure that applicants have the necessary qualifications and skills and are thus suitable for the job of a car dealer. When you apply for a license, you will have to meet a range of requirements. Among them is posting a Connecticut auto dealer bond. Find out the basic steps that you have to undertake so you can kickstart your dealership journey in Connecticut. Auto dealers in Connecticut have to apply for a license with the state Department of Motor Vehicles. There are some differentiations between the criteria you have to satisfy to obtain the specific license types. Once you’ve selected the license type that you want to apply for, you have to get familiar with the exact requirements that the DMV has imposed. Site drawings in accordance with the License Application Drawing Specifications (K-93). 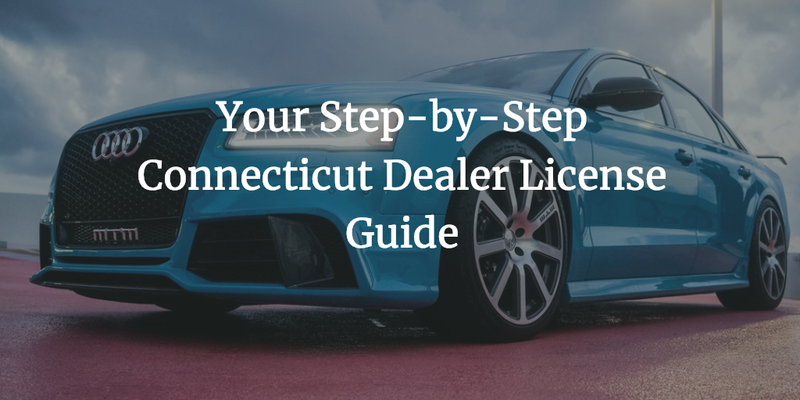 You can find the full information in the Procedure for Obtaining a Connecticut Dealer License document. Among the basic requirements that you have to fulfill for your CT dealer license is obtaining an auto dealer bond. This surety bond serves as an extra layer of protection that guarantees your compliance with state law. The required bond amounts are $50,000 for new and used car dealer licenses and $5,000 for general and limited repair licenses. In order to get bonded, you have to pay a small percentage called the bond premium. It is typically between 1% and 3% of the bond amount in case your finances are stable. This means you may end up paying only $500 for a $50,000 bond. The bond price is determined on the basis of careful consideration of your personal and business finances. The most important factor is your credit score, but company financials and any assets or liquidity you may have also influence the cost. In general, the more solid your financial situation is, the smaller your bond price is likely to get. Do you have further questions about the licensing and bonding process for auto dealers in Connecticut? Don’t hesitate to get in touch with us at 866.450.3412.